Tyrone Steele is a freelance drummer based in the Atlanta area. He proudly endorses Bootleg Drum Company and Soultone Cymbals. 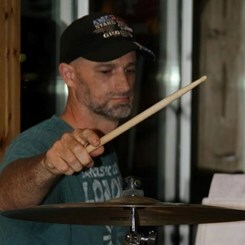 Tyrone maintains memberships with BMI and Atlanta chapter of the Grammy Recording Academy, and is the author of the Ultimate Drum Kit Learning Method (http://udklm.com). He has opened for the Red Dragon Cartel (Jake E. Lee), Joe Diffie and Mother’s Finest, and performs as an independent drummer in the Atlanta area. Request Lessons with Tyrone today!